Thanks for your reply to my questions. While I consider your answers here is the second of the five emails I promised to send each taking a different approach and each just skimming the surface of the great ocean of evidence for evolution. I’ve been looking forward to writing this one as the deluge of insights into how life works coming from genetics and molecular biology has all but drowned out the remaining arguments for creationism. However, I am also daunted by the task of knowing where to begin in explaining to you this vast and complicated field. So first, here’s a whistle stop introduction to genetics (I apologise if you already know this stuff)! The unique biological and physiological characteristics of every living thing is determined by its genome. The genome is a long string-like molecule called DNA that can be read like a book using only four letters; A, C, G and T. Combinations of these four letters can spell out genes which provide instructions for every protein and chemical process necessary for life. Depending on the species a whole genome can contain between hundreds and tens of thousands of genes. Every living creatures genome is inherited (at least in the case of most animals) from a mixture of half of each of its parents genomes (plus a few random mutations). For this reason not only can we look at an individuals DNA to trace its parents and grandparents, but go even further back to discover how related it is to other members of its own species or even other species altogether. With these facts in mind we can make several predictions about genetics for both the creation hypothesis and theory of evolution by natural selection. The genomes of different species would be completely unique and unrelated – like different books in a library. Genomes would be made up of perfectly ordered genes with no waste, errors or redundancy (since god cannot make mistakes). Humans, as gods favourite and most complex creation, would be set apart from other animals in having the most genes, chromosomes or other distinguishing genetic characteristics. Species genomes would share huge regions of similarity – like a single book that has been copied many times with each draft accumulating small changes. Genomes would contain evidence of continuous change including, redundancy, inefficiency and regions of non-coding (or ‘junk’) DNA. The human genome will be no more and no less remarkable than any other species. As we saw in my previous email each of these predictions are mutually incompatible which means determining one as true shows the other must be false. To do so we will go over each point, 1 through 3, to find what is observed in the genetic evidence. Since finishing the human genome project over a decade ago the number of other species genomes that have been sequenced has exploded. We now have the tools and information to definitively answer the question, is all life related to each other at the genetic level? If different species were created separately then different genomes would show little or no overlap –like the text of different books in a library. If, however, all species evolved from a common ancestor their DNA would share more similarity the closer they are related –like mighty tomes whose text had been copied from the simpler version before it and the simpler version before that until the branches finally converge to an orignal single page (containing only the instruction how to copy itself). Though it’s lacking legible detail at this scale, I find it incredibly inspiring, and totally amazing! It is the branches of the evolutionary tree laid out in a circle so more species names can be added. The thicker, blurred dark line around the edge of the circle above is actually a list of 3000 species names! The close up below it shows the section containing us. 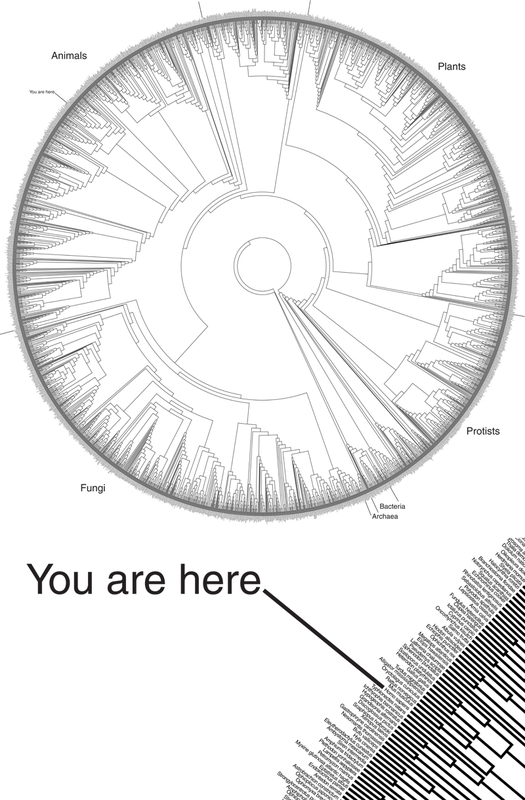 It really is incredible, especially when you consider this Tree of Life only represents about 0.18% of the species that have been formally named (1.7 million), and a jaw dropping 0.03% of the estimated 10 million species that populate this earth. Also remarkable is the fact the rate of micro-evolution on the Tree of Life is consistent with the rate of the macro-evolution of the tree. Consider also the fact that we have many areas of non-genetic study that consistently back-up the chronological order of the tree. Ultimately what genetic evidence proves is we humans are cousins of chimpanzees. We’re also related to dolphins, kangaroos, slugs and pond scum. But you know what, just as learning that the sun doesn’t revolve around us, it’s liberating to discover that nature doesn’t revolve around us either! If you bought a book only to discover that around 95% of the text was meaningless gobbledegook and that the remaining 5% that made any sense was scattered about randomly, would you think the author is any good? Well that’s how your genome looks. The blueprint of life within every cell in your body, and of most other species, is mostly “junk DNA”. Junk DNA, or more correctly “non-coding DNA”, is any material within a genome that doesn’t do anything. Some non-coding DNA has proved to be functional, to be sure, but the vast majority of it has absolutely no use. We know this as whole sections of junk DNA can be cut out or replaced with randomized sequences with no effect on the organism at all (Nóbrega et al. 2004). Why would a perfect god author so much nonsense? Is he dyslexic? In fact it turns out the reason has to do with the ways genomes evolve over time. One such way is that mutations sometimes cause a gene to duplicate in the genome allowing one to evolve independently of the other, in some cases to the point where the old gene is no longer needed and gets ignored. A large proportion of non-coding DNA is made up of these pseudogenes, which no longer have any biological function but were once functional genes. Study of these pseudogenes is revealing startling things since many appear to be genes used by our pre-human ancestors but which are still active in other living species. There are fossils buried in our very own DNA! Bacteria, on the other hand, have virtually no junk DNA! Does this mean god prefers bacteria since he was less sloppy with them than with everything else? No, and again the real answer comes from evolution. Bacteria lack unused genetic material because it takes more time and energy to replicate, and in a species where survival depends on fast replication natural selection has taken out the garbage. I’ve come across creationists who view all life as on a ladder of increasing complexity, a scala natura, with bacteria at the bottom and Homo sapiens at the top. If we have learned anything from genetics then it is that there is no ladder! There is quite a bit of interest among creationists in comparing the number of genes between species with an expectation that the amount should be linked to organism complexity. Before the human genome was sequenced the expected number of genes most commonly cited for humans was 100,000. It turned out to be only around 23,000. Since then we have discovered that this number is pretty average even when compared to other species to which we intuitively attribute lesser complexity. Notably, we share about the same number of genes with worms (Caenorhabditis elegans 20,069) and sea urchins (Strongylocentrotus purpuratus 23,300), have only a little more than flies (Drosophila melanogaster 14,039), while the rice genome (Oryza sativa 50,000) beats humans hands down. Limiting ourselves to animals the most genetic complexity discovered so far belongs to a tiny, almost microscopic, crustacean – the water flea (Daphnia pulex), with 31,000 genes, almost 8,000 more than the human genome. What is even more surprising is it shares more genes in common with humans than any other arthropod sequenced to date, and one third of its genes are completely new to science (Colbourne et al. 2011). The reason why the water flea genome contains so many genes is because it is particularly good at duplicating existing genes that go on to acquire new functions very quickly. The author of the research said the majority of the genome is a reflection of how the animal has evolved to cope with environmental stress (it is often found in toxic ponds). What to make of all this? Had god ran out of genes when he got around to humans? We now know that to think the number of genes makes a species more complex or somehow superior is ridiculous; it certainly doesn’t, since other factors such as the interaction between genes are also extremely important. After all, Jerry Lee Lewis and Beethoven used the same 88 piano keys to play very different music. What we can make of all this, however, is that none of the complexity we find in genetics makes any sense until you view it in the context of evolution. I hope one day we can both share a sense of awe and wonder at what our species is just beginning to discover about our true origins and how inspiring the fact of evolution is. It shows we are not apart from nature; we are nature. Our purpose is not to be slaves to a celestial dictator; we each decide our own purpose in life whether it be love, friendship, art, science, etc. Our destiny is not written for us; we are the authors of our own futures. This life is not a pale shadow of an afterlife yet to come; this life is all we will ever have and is all the more precious for it! P.S. Just one last thought, isn’t it interesting to observe that the four letter language for encoding DNA is the same for all species on the planet? It didn’t have to be this way if an outside being created them separately. Conversely, it would have to be this way if life evolved. Now, you could argue that god designed all genomes in the way evolution predicted to test our faith, but this would be as ridiculous as saying god planted all the fossils in rocks just to confuse us. Besides wouldn’t that mean you believe in a trickster god that likes to deceive us? Nóbrega, Marcelo A., Yiwen Zhu, Ingrid Plajzer-Frick, Veena Afzal and Edward M. Rubin, 2004. Megabase deletions of gene deserts result in viable mice. Nature 431: 988-993. You might have her read something by John F Haught. He’s a Catholic theologian whom I’ve come to like. I read one of his books, “God and the New Atheism”, and I think he does a decent job of explaining how decent theology and decent science should never be at conflict. Thanks for the tip, I’ll check it out. Unfortunately, part of the evangelical dogma my creationist mum believes is that Catholics are not “True Christians” and so cannot be trusted. Besides a 6000 year old Earth and talking snakes is not “decent theology” by any stretch. But you raise an interesting idea that if she is immune to logic then perhaps I should focus first on just shifting her theology towards one that’s not so batshit insane. It’s pretty easy to disprove Biblical history and and accounts Creationism, but it’s slightly more difficult to disprove the idea that god set this scientific sequence in motion with the intention of evolutionary freedom and, thereafter, human choice. Perhaps that is the next argument you could tackle? In any case, I agree with you fully and enjoy the clear way in which you’ve established the disconnection between genomes and the ideas of Creationism. And with a few good laughs. If anything, I would hope that the Creationist could understand the incredible complexity and beauty that an atheist can see (liberating, as you called it), and that those emotions of humility and awe are not limited to those who believe in an invisible celestial man-thing. I’m glad you are finding the explanations clear. I’ll definitely bear your suggestion in mind for when the time is right. What you are describing is the deist view that god kicked off the universe and then pretty much just sat back and let things happen according to the rules of science which he came up with. Frankly it would be a lot easier if my creationist mum did believe that but based on her own answers in the previous post I now know she doesn’t. Is that the eye of god in the center, connected to everything?